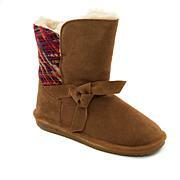 Channel classic Nordic style in this suede and knit laced boot. 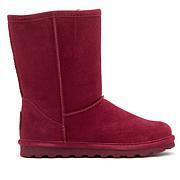 The angled design features metal D-rings and studs plus the signature wool and sheepskin lining. 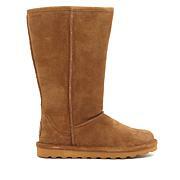 Trudge outdoors in boots designed to keep you warm and dry, all in classic BEARPPAW style. It's one of our faves! Love these boots so much. They fit well and are warm. The water proof feather make them perfect. I bought these for a friend, wish I bought some for myself. Warm, comfy. Love this Boot! Very Comfortable! Runs snug! Get one size up! Keeps your feet so warm, and dry! Great anytime boot! GO Anywhere! Slips on and off! Ordered up one size and got good fit. I put an 18" Velcro strap of same color (navy) around ankle area and got perfect fit. I got them in a size 7 in the deep blue color. I normally wear size. 6 1/2 or 7. They fit perfect, they are warm and i love the beautiful color. They run a little bit narrow, so if you have a wide foot don't bother.